Developer Tony Cho and investor Bob Zangrillo, the CEOs of Dragon Global and Metro 1 respectively, aim to transform the neighborhood of Little Haiti in Miami. Working with Miami studio Arquitectonica, the pair proposes that areas between Northeast 60th and 64th streets to the south and north, and Northeast Second Avenue and a railroad line to the west and east, be developed (in phases) as a gargantuan mixed-use project. 170,000 square feet of the site's former industrial spaces will be repurposed to include an innovation center for start-ups and businesses. According to the Miami Herald, Cho and Zangrillo hope to bring entrepreneurs to the $1 billion campus and keep them there, offering housing and spaces to both work and play. “We are investing money, cleaning things up, bringing more street lights and security in the neighborhood; we’re bringing in art, creating jobs,” Cho said. “I see Miami melding as an urban node. 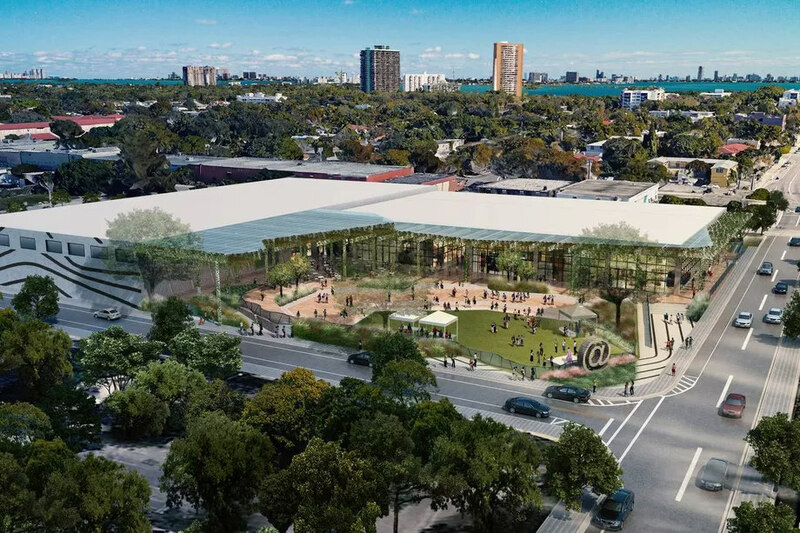 These are all becoming very interesting neighborhoods.” Phase one of the "Innovation District" will see the construction of a sculpture garden, a 30,000-square-foot "Magic City Studios," and the innovation center. The latter will span 15,000 square feet and be part of the "Factory," which will also feature an amphitheater for events. Despite the wealth of square footage available, none will be allocated to parking, furthering the walkable and pedestrian friendly campus feel of the development. 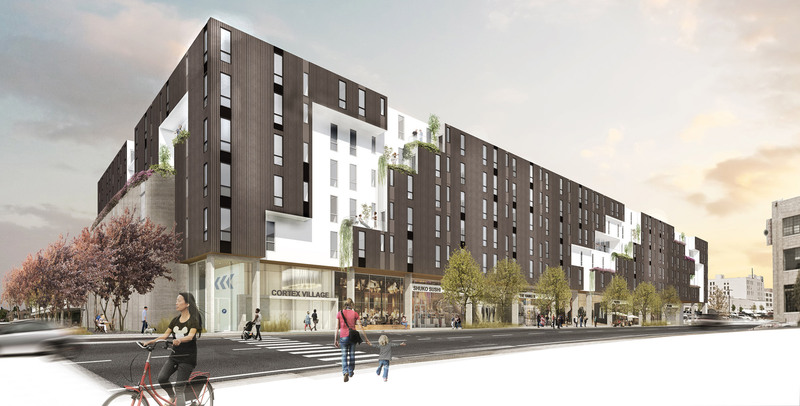 Instead, small apartments will negate the need for what Cho calls a “behemoth garage space” that would take up valuable land and only drive up the cost of housing. Speaking in the Wall Street Journal, Cho added that ride-hailing apps would plug the transport gap. 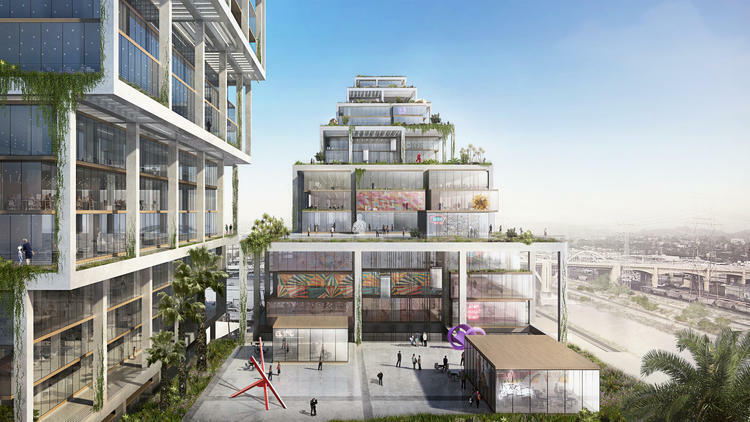 The Herald, meanwhile, also reports that listed tenants so far include Salty Donut, Aqua Elements, Photopia, Baby Cotton, ICA (Institute of Contemporary Art), Wynwood Shipping, and Etnia Barcelona. Phase one is so far penned for 2018 and will be privately financed. The Zangrillo and Cho also mentioned that office and retail space, affordable workforce housing, including micro-units, and even a boutique hotel could possibly come in the future. Bratz Doll manufacturer MGA Entertainment and Santa Monica—based Killefer Flammang Architects (KFA) are breaking ground today on a new 24-acre mixed use campus headquarters for the toy- and electronics-maker in the Chatsworth neighborhood of the San Fernando Valley. Dubbed "24" by Uncommon, the real estate company developing the project, the design calls for the adaptive reuse and expansion of an existing industrial structure. (Formerly, it was a Los Angeles Times printing facility.) The developers aim to create approximately 255,000 square feet of office space in the reused building. MGA will move its headquarters from nearby Van Nuys to the new facility and will concentrate development of its wares on-site. KFA’s master plan for 24 features several mixed-use housing blocks containing 660 apartments on land that is currently being used for parking. The apartments will be located above storefronts, with the complex also containing urban amenities like gym facilities, a pair of swimming pool areas, and a park for recreational sports. The complex will also contain a pre-school, community garden areas, and an amphitheater. 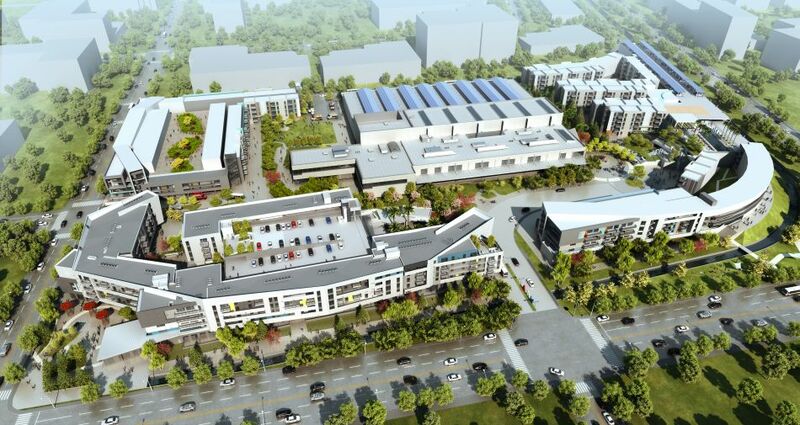 Regarding the expansion, chief executive of MGA recently told the Los Angeles Times, “The new facility will be a state-of-the-art facility for people to create and work and live and play.” A rendering released by the developers shows the reused printing facility located at the center of the site surrounded by multiple clusters of five- to seven-story apartment courtyard blocks. Surrounding city streets flow into and out of the complex, with internal pedestrian areas generally separated from automobile traffic. The project, which will also feature a transit plaza that will connect to the nearby Orange Line bus rapid transit line and Chatsworth Metrolink commuter rail station, is bounded on its southern edge by a creek that feeds into the Los Angeles river. The project comes as sections of the low-rise industrial and suburban western San Fernando Valley begin to densify and coalesce around new pedestrian-oriented urban centers. Another recently-announced development includes the Westfield Promenade 2035 by Westfield Corporation, Johnson Fain, Togawa Smith Martin Architects, and HKS Architects. 24 will be built in phases with the adaptive reuse component coming by 2018 and the housing component gradually phased-in between 2018 and 2022. 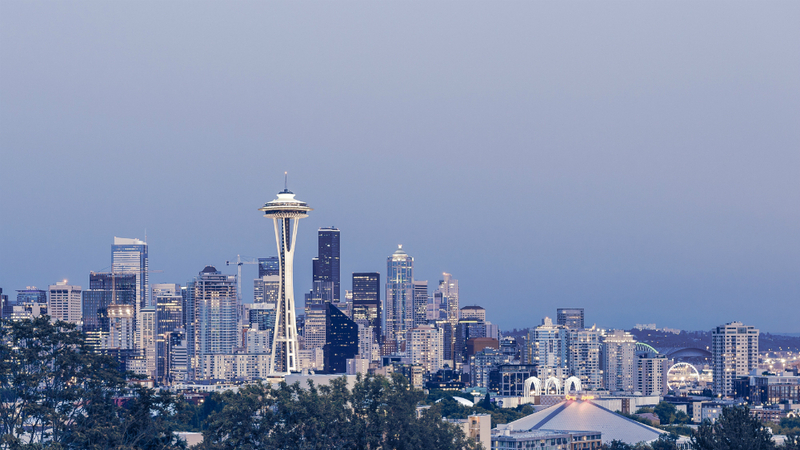 A recently-released report by construction and building consulting agency Rider Levett Bucknall has determined that for 2016, Seattle has surpassed New York City and Los Angeles as the city with the highest concentration of construction cranes in operation. 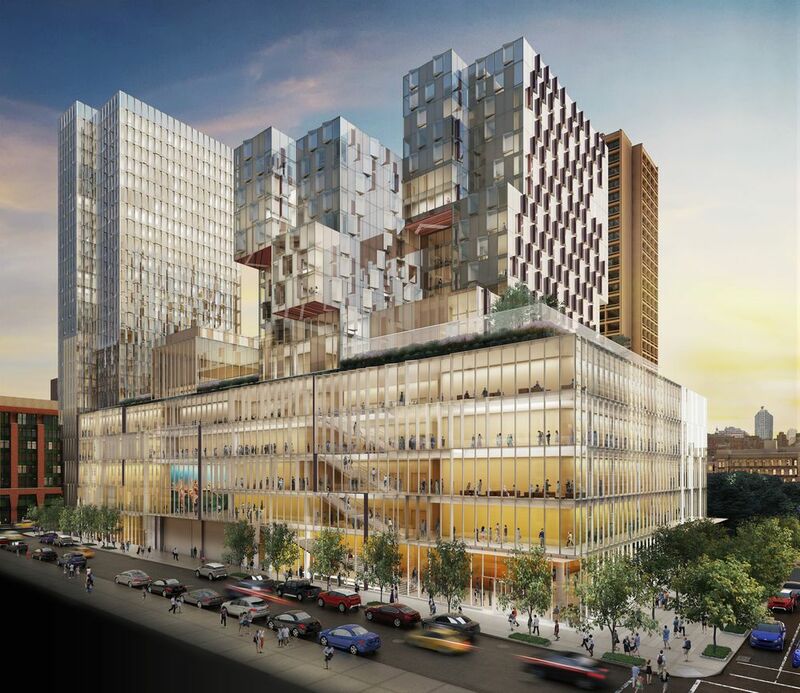 The Pacific Northwest city is currently experiencing an unparalleled construction boom: In addition to high-rise, mixed-use construction projects going up across the area, a new neighborhood of high-rise skyscrapers is sprouting up adjacent to the new, NBBJ-designed headquarters for online retailer Amazon. More to the point, according to the report, Seattle has 58 construction cranes in operation. That’s more than New York City and San Francisco combined, which have 28 and 24 cranes each, respectively. This total more double Chicago's count (26 cranes) and is 18 cranes higher than the second-highest city in ranking, Los Angeles (40 cranes). 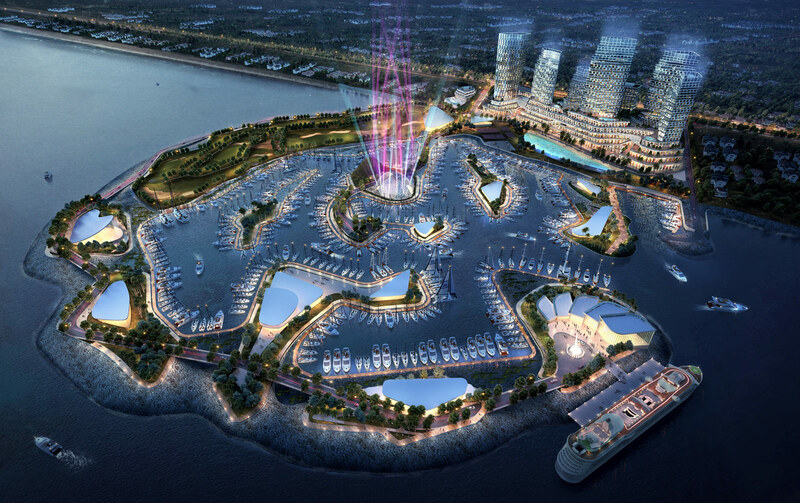 The report also sheds light on the expanding scope of large-scale construction projects dotting the West Coast. Seattle’s booming Denny Triangle neighborhood, the aforementioned Amazon-adjacent condo-town, and various other downtown developments are leading a city-wide push for new construction. In San Francisco, the Transbay Center and Salesforce Tower complexes, as well as the surrounding and also-booming South of Market neighborhood, are raising the skyline higher. And in Los Angeles, luxury developments like the Metropolis, Oceanwide Plaza, and Wilshire Grand Hotel projects, each of which will ultimately cost more than $1 billion to build, are throwing up cranes there. The report also lists 22 cranes dotting the skyline of Portland, Oregon, a city with a comparatively lower skyline populated by a higher number of the mid-rise, seven-story and up structures that require cranes for construction. According to the report, Seattle has seen a 43-percent increase in crane counts since this time last year, led by the commercial, mixed-use, and residential market sectors. One unknown from the rapid pace of construction, however, is if the overall increase in development will have a noticeable impact on housing prices across the region, which from San Diego to San Francisco and Portland to Seattle remaining stubbornly high. 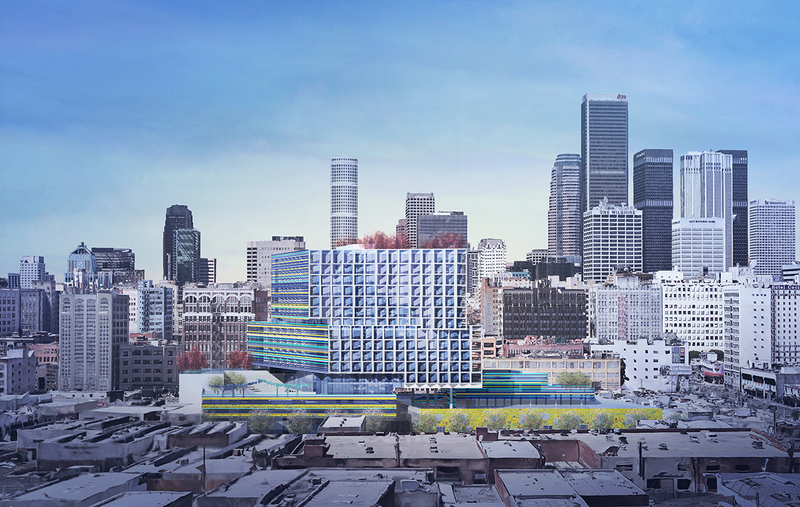 Los Angeles–based architects Brooks + Scarpa has revealed plans for the large-scale redevelopment of the 107-year-old Southern California Flower Market in Downtown Los Angeles. The proposal aims to replace the two existing industrial structures on a 3.8-acre site at 755 Wall Street with a mixed-use, podium-and-tower complex. 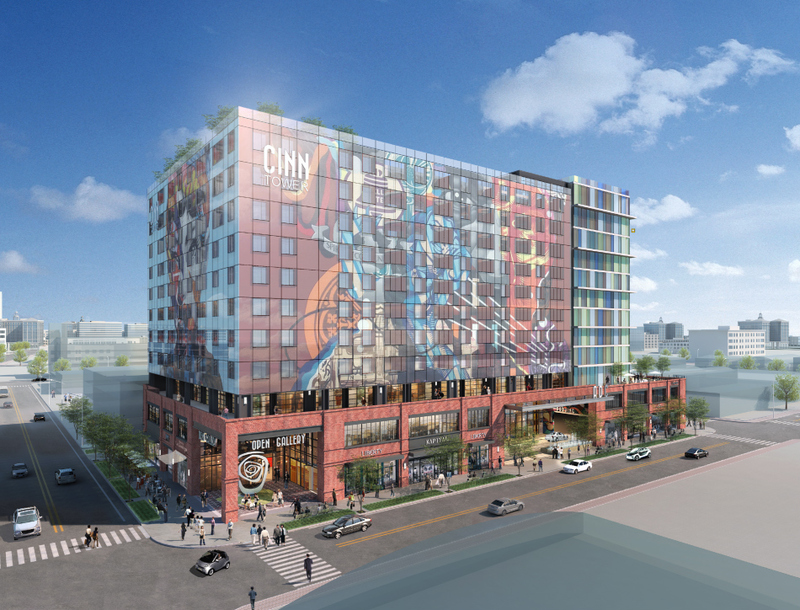 The proposed redevelopment would consist of a low-rise podium tower that will house mercantile facilities for the existing flower vendors along the ground floor, with between 50,000 and 60,000 square feet of office space and stacked parking above, while a second building on the site will consist of a 14-story apartment tower. That tower would include 290 apartments plus an undisclosed number of affordable units and would overlook a solar panel-topped amenity level meant for use by building residents. 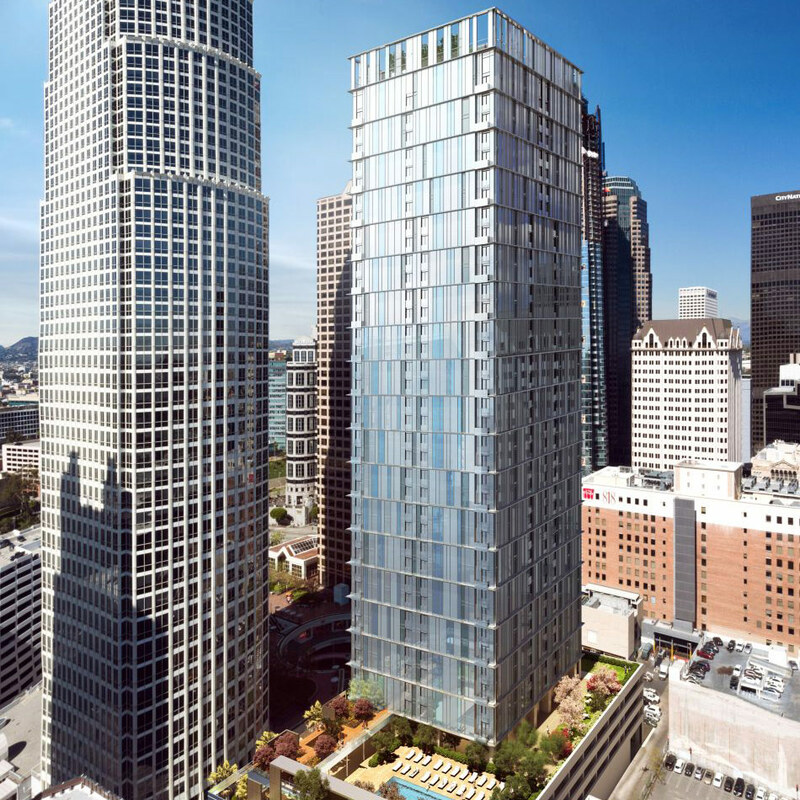 Preliminary renderings released for the project show a colorful, gridded tower rising out of the podium, with two of the tower’s exposures clad in what partner Angela Brooks described to Los Angeles Downtown News as flower-themed murals. Brooks went on to explain some of the inspiration for the project, telling the publication, “It's the idea of using the flower. It's going to be very modern in its design, but we’re trying to honor the Flower Market through the art.” The Flower Market was originally founded in 1909 by Japanese-American flower growers in a nearby area and moved to its current location in 1923. The Flower Mart is still owned by the descendants of that original group of owners and the proposed redevelopment scheme is part of a regional effort to preserve Los Angeles’s industrial and mercantile functions and heritage while accommodating a new and furious spurt of urban growth. The recently-revealed 6AM project by Swiss architects Herzog & de Meuron has similar conceptual underpinnings, with a housing tower and mercantile areas sharing the same site. The project aims to break ground in 2018.